Whether you grew up with a computer in the ’80s, pirated a copy of Photoshop in the 2000s or ran a benchmark on a video card last year, you’ve come into contact with a cracktro in one form or another. Also called a Crack Intro or Loader, these screens were first appended to pirated software in the late 70s and early 80s by the groups that cracked them. They served as digital graffiti, a way for the cracking “crew” to stake their claim, brag about their accomplishments and shout out to friends and rivals. As such they rapidly evolved into ever more elaborate feats of visual programming until some coders detached their efforts from the shadier side of things. By 1986 the movement became known as the Demoscene and would later inspire benchmarking software to find dazzling ways to tax computer hardware. The legacy of the cracktro would also be carried on beyond the 90s in the form of keygens; tiny programs that generate serial keys for pirated software. Wrapped up in that thirty year history is the music that accompanied the illicit cracktros, trainers and keygens, some of which outmatched the games they were attached to. While crews have left their calling cards on virtually every platform, this playlist (which can’t be embedded here) by YouTuber Zeusdaz features solely the Amiga. So prolific was the cracking scene back then that even this incomplete collection clocks in at an astounding eight and a half hours. 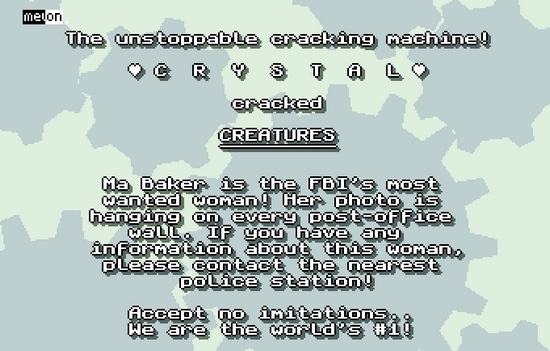 It serves as a great intro to cracktros, offers a time capsule-like glimpse into the scene and it was even captured directly from a real Amiga. No emulation from Zeusdaz! It’s also a convenient playlist to pop on for quick audio/visual party ambiance. Tracking down the coding composers behind these tunes is an even more daunting challenge and one I’d like to dig into… someday. For now I’ll point curious parties to Wikipedia, Cracktros.org, SceneMusic and Kestra Bitworld to see how deep the cracktro hole goes. I can’t remember any by name but there are definitely some cracktros and keygens I would repeatedly load up just to listen to. What about you? Any memorable crack or trainer tunes? Do you know another good source for even more cracktro themes? Let us know below. Disclaimer: Original Sound Version does not endorse software piracy for the sake of listening to cracktros, no matter how cool their music might be.